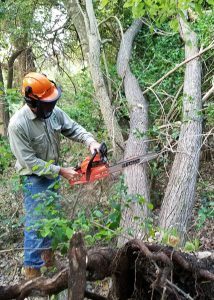 Hazard assessment and clearing the natural areas following two major storms was one of the most important accomplishments performed by the trail crew. The first storm was billed as, “The storm that wasn’t; then it was,” by the San Marcos Daily Record, April 12, 2017. More than six inches of rain fell mid-day on the 11th shutting down streets. The forecast storm required trail crew to scout and clear hazards in Spring Lake Preserve, Schulle Canyon, Ringtail and Upper and Lower Purgatory. With approval from Parks and Rec the volunteers found “hangars”, tree limbs hanging above the trail ready to fall. The hazards were cleared without incident making the trails safe for recreational use. 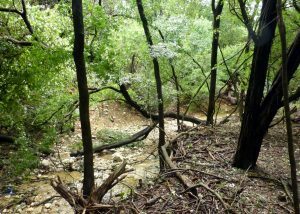 Pre-Hurricane Harvey the crew cleared log jams from the Sessom Creek bed to prevent bank erosion during the forecast storm. After Harvey blew through the crew again performed a hazard and damage assessment and then cleared the obstacles every day from August 28 through September 3 and then again on trail crew workdays, September 8, 14, and 21. Trail crew spent 202.25 hours on storm mitigation including the December snowfall. The trail crew also created new trails on Dante in Lower Purgatory, Bamboo Chute in Sessom Creek Park, and re-routed Rypheus in Lower Purgatory and Centipede in Spring Lake. 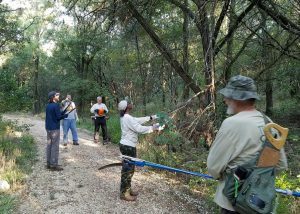 Work in Sessom Creek Park included invasive removal of ligustrum, bamboo and nandina with the Sessom Creek Neighborhood Association, Hays County Master Naturalists and Habitat Conservation Plan volunteers; 12 work days totaled 290.5 volunteer hours. A minimum of 50 pounds of native wildflower and grass seed, purchased by the city, was spread in the natural areas to combat erosion, repair damage from feral hogs and increase pollinator visits. Total volunteer hours logged was 1,824 which is probably an undercount from mapping, scouting work sites, watering trees and a myriad of other tasks associated with good stewardship.